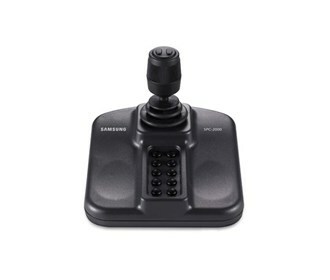 The Samsung SPC-2000 is a 3D Joystick Controller for network-based camera control. It can control the pan, tilt, and zoom operations of cameras. Its quick and easy installation allows rapid setup, and enhanced system compatibility ensures seamless operation. The Network Controller Joystick is compatible with the SVM-S1 and SVM-P1 software. It is also provided with ease of connectivity via a USB 2.0 and DirectX interface. The Samsung SPC-2000 has many exciting features for users of all types. See the Samsung SPC-2000 gallery images above for more product views. The Samsung SPC-2000 is sold as a Brand New Unopened Item.